On this episode of The Gunmetal Armory, we are discussing ‘Building A Better BOB’. When analyzing your BOB, there are multiple things that you must look at. We will discuss them in detail, look at how to optimize what’s in your BOB, and how to streamline how its carried. 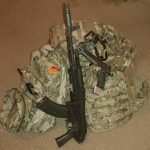 We will also dive into various products you may not have heard of, redundancy protocols, what is and is NOT needed, weight reduction, and low-coat options for the frugal-minded prepper. Listen to this broadcast or download “Build A Better Bug Out Bag” in player below! In addition to this weeks show, I will also be doing the usual “Prepper Product Pick Of The Week” (you’ll find out what my pick is on the show) segment, and another Product GIVEAWAY!!! This week, I’ll be giving away a pair of Rattled Straps “Flint Laces”. 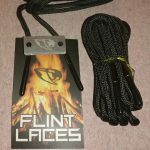 The Flint Laces are incredibly useful and include 2 flint rods that replace the aglets on a normal pair of bootlaces, as well as a small metal striker plate. I will be following my usual protocol and asking a question about guns, gunsmithing, or weaponry in general. If you wanna participate, you can come into the chat room and try to win, or call in and try to win via phone. Previous: Previous post: Core Goals Standing the Test of Time! Next: Next post: G.O.O.D. Game Bugging Out!